3. The Internet had not yet become the source of information on every conceivable topic it is today; and the fact is only a relatively small percent of South Carolinians had access to a computer. With the very capable help of Maggie Bostic as a document designer, we made the cut and the rest of the story about the manual is one for the books. In the 24 years since then, I’ve had the good fortunate to assist people in South Carolina and around the country with the formation of every conceivable type of nonprofit organization and more complex structures in which the nonprofit organizational form has a key role. It has been challenging, exhilarating and gratifying. Standing out from all of them is SC UpLift Community Outreach a community-based community development organization that has operated in Aiken, Chester, Fairfield, Kershaw, Lexington, and Richland Counties to ensure that poor and moderate income elders and families have quality, safe homes to live in. Among the folks who have benefited from SC UpLift are homeless Veterans, elderly people and a lot of struggling young families with minor children. 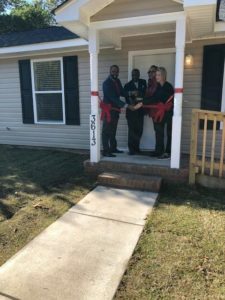 SC UpLift has been generous in its support of other community based initiatives in devastated and low income neighborhoods by serving as fiscal agent for wide ranging local programs that would not have received funding without SC UpLift standing in the gap. Most impressive about SC UpLift is its faithful adherence to accepted standards of high performing practices known to be critical to the sustainability of nonprofit organizations. They operate within the tight but essential boundaries of impeccable integrity. The organization’s executive leader is Kevin Wimberly who with his wife Tammy are the founders. Affordable housing is at its core and all of us have special feelings about what a home means in our own lives. While the organization directly engages in different strategies to remain focused on its mission, it is especially adept at finding collaborative ways with individuals and other groups to provide services in low income and devastated communities so their members receive and participate in other activities that “round out” what “community” really means in the broadest sense. These ventures have covered educational, historic, and social needs whose developers frequently ask UpLift to serve as fiscal agent for grants to support community-initiated activities—a vital function when neighborhoods lack access to a federally exempt nonprofit organization. This organization is one in which I take great personal and professional pride. SCUplift’s adherence to the standards of high-performing nonprofit organizations has made possible better lives for thousands of South Carolina’s low to moderate income communities. And that folk, is the major expectation of all nonprofit organizations that enjoy the benefit of federal tax exemption and the privilege of indemnification. Your monetary support of this organization will be rewarded with a consultation with Kevin on any aspect of concerns you may have about an organization that is special to you. Upon request I will join Kevin in this process. Tax deductible donations can be made on-line at www.scuplift.org at the “donate now” button on the home page or you can mail your check to SC UpLift Community Outreach, P.O. Box 3728, Columbia, SC 29230.